Early Intermediate Level 4 Showcase Solos Pop Duet for One Piano, Four Hands. Composed by Irving Berlin. Arranged by Eugenie R. Rocherolle. Educational Piano Library. Movies, Christmas. Softcover. 8 pages. Published by Hal Leonard (HL.174799). ISBN 1495074641. 9x12 inches. 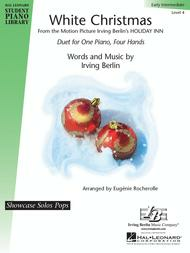 Irving Berlin arr. Eugenie Rocherolle. Eugénie Rocherolle brings us a beautiful treatment of Irving Berlin's holiday classic at an intermediate level duet for one piano, four hands.